Take a break someplace cool with something cold to drink and read the Brunswick Real Estate News, July edition. 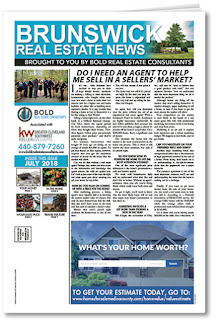 Our cover story answers the question "Should I hire a real estate agent in this seller's market?" Ever wonder the difference between damsel and dragonflies? Bring the kids to the Susan Hambley Nature Center to find out about these intricate creatures. Details are on page two. In addition, you'll also find some great travel and decorating articles, as well as a delicious recipe from Wolfgang Puck.